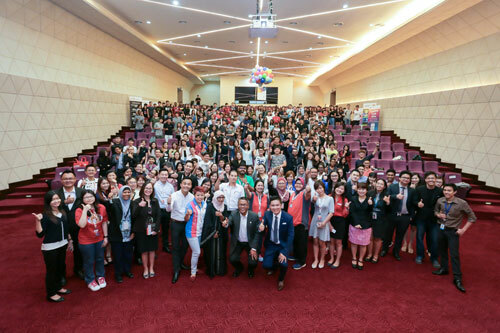 35 companies including event sponsors Nestle, Feruni, AIA, AVIS, Resorts World Genting, YTL and UOB, drew over 1,600 students to the two days of insightful talks and workshops during INTI’s Career Fair 2016. The 35 companies and organizations which included event sponsors Nestle, Feruni, AIA, AVIS, Resorts World Genting, YTL and UOB, drew over 1,600 students over two days of informative and insightful talks and workshops held at Career Fair. GTI Media was the Official Graduate Career Partner. Other participating companies were Alliance Bank, AM Met Life, APM Automotive, Ben Corp, CPA Australia, DAMCO, Great Eastern, Group M, HPE, HTZ Resources, KPMG, Nirvana, Out of the Box, Paypal, PWC, Public Mutual, SP Setia, Southern Lion, Speedwing, myStarjob.com, Takaful Malaysia, Trueventus, TASCO, Graduan and Hartamas. “We received very positive response from our industry partners who have used this event as a platform for talent search. Their generous support bears testament to the quality of our students who have learned the INTI way encompassing 3Is – international exposure, innovative learning and individual development. 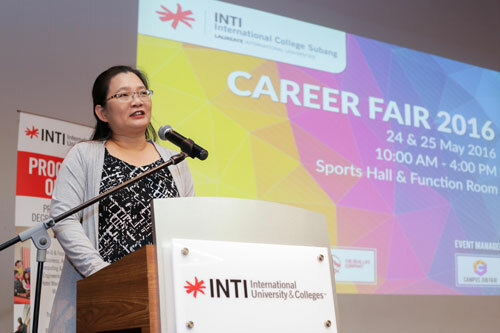 This has given our students an edge to understand the challenges that lies ahead, align themselves with employers’ expectations and be industry-ready when they graduate,” said Tan Ling Ling, Chief Executive of INTI International College Subang. In addition to impromptu job interviews held at the Career Fair, talks by industry representatives were conducted throughout the event to help students better understand the needs of the employment market. “The great response by our industry partners who have come to source for their human capital needs at our campus bear testament to the quality of INTI students,” said Tan Ling Ling, Chief Executive of INTI International College Subang. “Relationships with potential talent need to be nurtured early. Sharing industry insights with students would help them build their confidence and trust in the relationship. It also helps students to make informed decisions as to which career path they would want to commit and invest their time and effort in as they enter the work force. This Career Fair is a great opportunity for students to speak to industry partners and gain an edge that will hopefully foster a meaningful and fulfilling career,” said Yee Yuen Chin, HR Director, Syarikat Pembenaan Yeoh Tiong Lay Sdn Bhd (SPYTL). “We ensure the quality of our graduates which consequently results in high employability. We do so by helping graduating students better understand the job market and employers’ needs on an ongoing basis, thereby enabling students to adapt seamlessly into the real working environment and be valuable assets to their employers,” Tan added. With partners ranging from global MNCs and home grown giants, INTI has the distinction of being able to ensure 100% internship placements for all its students. Additionally, 78% of INTI graduates earn above market average salaries in their first jobs, and 97% are being employed within six months of their graduation.